There were some big-name drop-outs and exclusions from this year’s rankings – who is likely to return and who is gone forever? Just as light follows dark, the highs of a footballer’s career will eventually be replaced by lows – and the annual Goal 50 acts as a useful measuring stick for the pace of change. While some stars, such as Neymar, have gradually moved up the rankings as their stock has risen, others, like Kaka and Steven Gerrard, have slid down the pole before disappearing entirely. In some instances, a player has returned after years in the wilderness – in this edition, Franck Ribery narrowly missed out on Lionel Messi’s top prize having last appeared in 2009. Below we take a look at some of the high-profile dropouts and exclusions from the latest Goal 50 and their prospects of making a return in the future. One of the biggest developments in this year’s Goal 50 was the sudden decrease of Barcelona and Real Madrid representatives. In both 2011 and 2012 the Clasico couple provided 15 players between them, while in 2010 they supplied 13. This week’s list saw the Spanish giants offer a record-low of four – the winner Messi, third-placed Cristiano Ronaldo, Andres Iniesta and Raphael Varane. 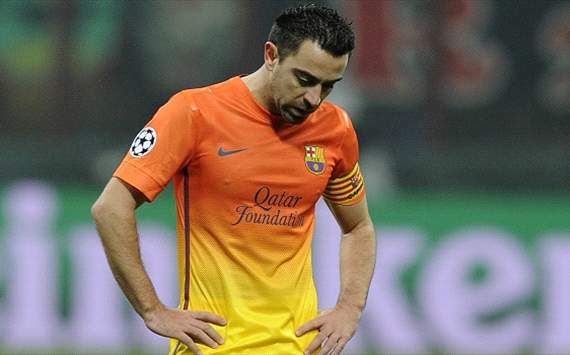 Xavi is perhaps the dropout most at risk of not returning to the 50 despite previously appearing in every countdown. The 33-year-old has undeniably declined over the last 18 months. Slower and unable to execute his pressing game or complete two matches in succession at an optimum level, Xavi is ageing fast. And his fortunes could have a knock-on effect on club team-mate Sergio Busquets. The 25-year-old must prove that he doesn’t just feed off Xavi’s brilliance if he is to make it back to the list. Cesc Fabregas also has a lot to prove if, as expected, he snubs Manchester United. New coach Gerardo Martino will be key in the ex-Arsenal star’s rebirth. Dani Alves, like Xavi, also seemed to be on a downward curve after a miserable 2012-13. But an exceptional Confederations Cup has suggested there is still fuel left in the tank, and with Brazil a potential winner of their own World Cup the ex-Sevilla star will fancy his chances of revisiting the Goal 50 next year. Two Barcelona heroes of recent years who will find it difficult to return, though, are captain Carles Puyol and David Villa. The former, who last appeared in 2010, is now 35, past his best and too injury-prone to mount a challenge, while the latter has moved out of the limelight to Atletico Madrid. The World Cup will be influential in deciding the next Goal 50. Thirty-three of last year’s list appeared at Euro 2012, which will provide hope to all of Spain’s national squad with la Roja travelling to Brazil as favourites. Iker Casillas, in particular, has a lot to gain given his incredible record of not conceding a knockout goal in three consecutive tournaments. After placing second last year, do not be surprised to see the Real Madrid captain return in 2014 – particularly with Jose Mourinho having departed Santiago Bernabeu. Sergio Ramos should also benefit from the arrival of Carlo Ancelotti, who is building a Madrid squad that looks a potential challenger to Bayern Munich’s Champions League crown. This will also open the door to dropouts such as Mesut Ozil and Xabi Alonso, although both will have to prove their worth amid fierce midfield competition. The 2012-13 list snubbed a whole host of Premier League legends. Didier Drogba was voted by Chelsea fans as the club’s greatest player of all time after dragging them to Champions League glory, exploits that earned him sixth place in last year’s Goal 50. Having transferred to China and then Turkey, the bulldozing striker barely troubled the 50 this time around. Physically declining and aged 35, it will be difficult for the Ivorian to return again. Drogba’s former Chelsea colleagues Ashley Cole, who placed eighth last year, and John Terry, who hasn’t appeared in the Goal 50 for four years, were also missing. Both are set to turn 33 in December, but with Mourinho having returned to Stamford Bridge and Chelsea many people’s immediate favourites for the Premier League, neither should be written off. Especially Cole, who remains one of the best full-backs in the business. Other Premier League greats to have fallen off the radar include Wayne Rooney, Nemanja Vidic, Rio Ferdinand and Steven Gerrard. 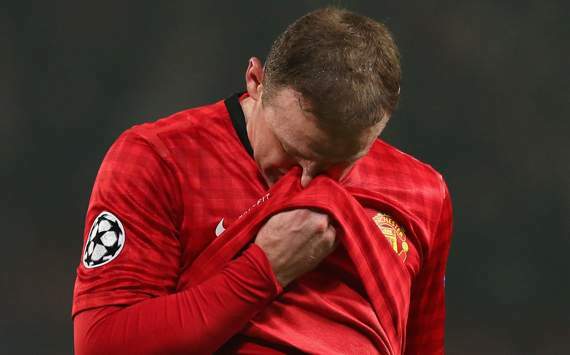 Rooney had appeared in every Goal 50 prior to this year, but there are serious concerns over whether, having burst onto the scene as a 16-year-old, he is already burning out at the age of 27. A summer move from Manchester United to Chelsea could give him a new lease of life, just as it did to Juventus architect Andrea Pirlo – who was bombarded with the same criticism – upon transferring from AC Milan in 2011 before proving all his doubters wrong. Vidic and Ferdinand have reached a point in their careers where their bodies are starting to slow down and they are unable to play too many games in quick succession. Vidic has made just 25 Premier League appearances in the last two seasons while Ferdinand turns 35 in November and won’t appear at the World Cup after retiring from international football. Both seem long-shots to return next year. As does Liverpool legend Gerrard, who has not featured in the Goal 50 since 2009. Now 33, Gerrard is a shadow of his former self and is playing for a Liverpool side who will not challenge for honours next term. Two of the biggest exclusions from the Goal 50 were Italian stars Mario Balotelli and Gianluigi Buffon, who were 13th and 38th last year respectively. 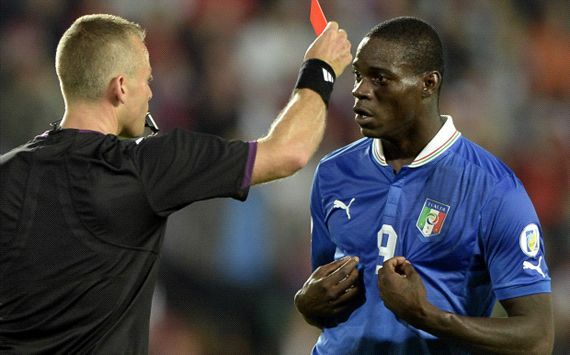 Balotelli was penalised despite a brilliant second half of the season with AC Milan after barely surfacing in the first half with Manchester City. But, despite his unpredictable and volatile temperament, the 22-year-old should reappear towards the top next year as he is an undoubted star man for both club and country. Buffon had a shaky Confederations Cup, but one of the greatest goalkeepers of all time doesn’t become a “pensioner” overnight. As captain of both a Juventus team who are favourites to win a third straight Scudetto and go far in the Champions League and an Italy side expected to challenge at the World Cup, don’t be surprised to see Buffon re-enter in 2014 either. It will be much tougher for some of Serie A’s other icons of recent years. Wesley Sneijder won the Goal 50 three years ago after inspiring Inter to the treble and Netherlands to the World Cup final. But he has fallen into a steep physical and technical decline ever since. The Dutchman even struggled at Galatasaray last season and will need to perform spectacularly in the Champions League and at the World Cup if he is to make a comeback. His treble-winning colleagues Samuel Eto’o and Douglas Maicon, both 32, can be as good as written off. The former will only compete in the Europa League with Anzhi, while the latter can count himself fortunate to have earned a move to Roma after a disastrous spell at Manchester City. Two Brazilian legends who have become somewhat forgotten in Europe are ex-Milan heroes Kaka and Ronaldinho. The current Real Madrid benchwarmer has not appeared in the 50 since 2009 and unless he departs the Bernabeu it is hard to see that trend being bucked with so many midfielders ahead of him in the pecking order, despite the arrival of his former Milan coach Carlo Ancelotti. The odds are much more favourable for Ronaldinho, though. The ex-Barcelona superstar was the last player to be dropped from the Goal 50 this year and is a good bet to make the cut next time having just led Atletico Mineiro to the Copa Libertadores crown.